5. nayumaworld - Online News, movie, music , local Programs etc. Mintokling Guest House Situated in Vanu Path, Gangtok, Sikkim. 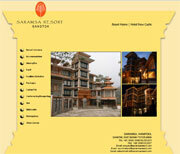 A beautiful resort located in a country side Gangtok, Sikkim. Located at Zero Point, Gangtok, Sikkim & Rumtek, East Sikkim, Respectively. Cheap & Best Hotel in Sikkim.